The dawn of the zombie apocalypse is upon us. We've been hearing about it in the news for quite a while now. "Be careful of anyone foaming at the mouth" and "please call the Center for Disease Control if you suddenly crave human flesh" are just some examples of public service announcements we're aware of. But we're innovators around here! A zombie apocalypse doesn't mean worldwide destruction and countless casualties as long as a game plan is in place and boy, you better believe we've got one. Our game plan is... *drumroll please*... to put those darn zombies to work! It'll not only be beneficial to us but the entire world, if we can transform the inevitable hoards of zombies into productive citizens in our society, so we came up with a brilliant idea:"why not use zombies for transportation?" We all have to go places and taking a piggyback ride is a lot better than burning fossil fuel that's harmful to the environment. 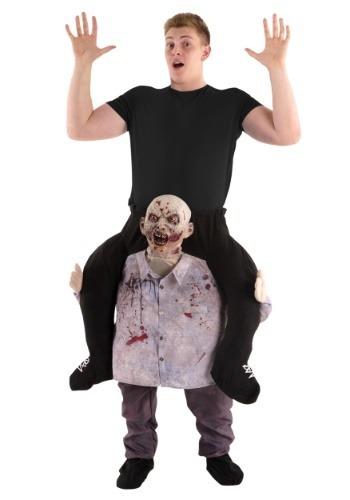 Transporting via a zombie's back to get to work just may solve all the problem's in the world. After experiencing a zombie piggyback ride, perhaps you'll become curious to see what it's like to hop on the backs of all kinds of bizarre beings. Lucky you, we have a skeleton and T-Rex adult piggyback costume so you can test those out too. Super easy to get ready. My daughter was a little zombie girl about the same height as the Zombie in the costume so it made it seem even more realistic. Turning heads and laughter all night.